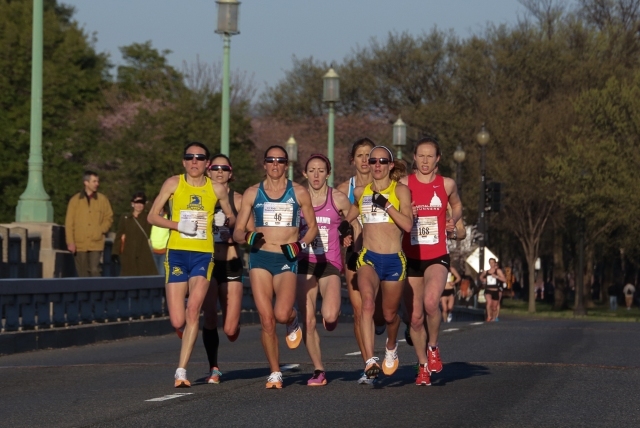 Janet Bawcom weighed her effort at the Cherry Blossom Ten Mile on going for the overall win and although she ran out of room to catch Ethiopian Mamitu Daska, she still came away with another national title and 52:12 finish that lopped 1:16 off the American Record she set last year, when she finished fourth. Daska and Aliphine Tuliamuk–Bol would surge away when Bawcom would edge up to them, and Bawcom spent time catching up before the cycle would repeat. 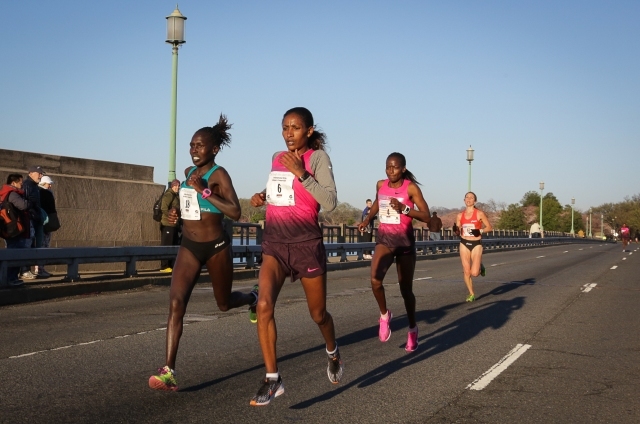 When Daska made a surged in the last mile, Bawcom tried to keep things going, but wasn’t able to chase her down before Daska broke the tape in 52:05,for a seven-second margin. Bawcom, along with second U.S. finisher Sara Hall, live in Flagstaff, Ariz. Hall, who has made much of her racing reputation on the track, had run a competitive half marathon and less-than competitive 15k, but felt adjusted to the 10 mile distance as she explores her longer-race options. “I still plan to run on the track this year, as short as the mile, but I am eyeing the marathon in the near future,” she said. Finishing in 52:54, she ran under the previous American record. Hall encountered a lot of the surging that Bawcom did, and wound up on her own the last five miles. Philadelphian Frances Koons ran what she called one her best races to finish as the third American. She started as a miler in high school but is finding longer distances to her liking. Susanna Sullivan of Falls Church finished fourth in the U.S. championship race and eighth overall, capping a stretch in which she ran what was at the time the fastest women’s 8k time at the St. Patrick’s Day 8k, qualified for the U.S. Olympic Marathon Trials at the Shamrock Half Marathon in Virginia Beach and finished second, to habitual D.C.-area racer Kellyn Johnson Taylor, at the Collegiate Running Association Championships in Richmond. That improvement was part physiological development, part racing maturity. She’s looking forward to a few down weeks now. Another local runner, Jen Bergman, had only been local for six days, having moved to Washington the prior Monday. Like Hall, she was making a transition to the roads, from her track background at the University of Arizona. She finished 25th in 57:13.